Parramatta Heritage: Faust - an individual sense of style. There is much we don’t know about Joseph August Faust. What we do know is that he was born in New York in 1871, of German heritage and spent his childhood in Pittsburgh. He migrated to Sydney in 1887 and was working as a painter and decorator in 1890. His first marriage to Mary Sparrow was in 1895 and they had a son Joseph Paul. Mary died in 1925 and he subsequently married Beatrice Inch in 1929, followed by Ita Reeves in 1937. He died in 1939 aged 67. Few traces remain of his life apart from some murals and photos. At the Parramatta Heritage Centre, we have some of the murals that he painted to decorate his home. Although Faust was a painter and decorator of considerable skill there is no other record of any of his other works. One of the more substantial samples of Faust’s work in our collection, is a large hand-painted ceiling mural. It is an interesting example of interior decoration from a house at 27 Galloway St, North Parramatta, where we know that Faust lived between 1929 and 1939. 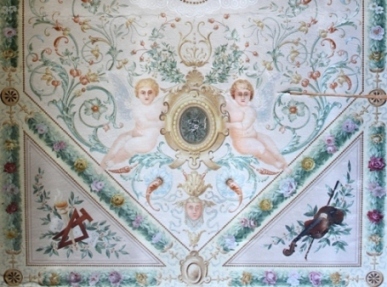 All the ceilings and walls in this house were covered in murals similar in style and colour to the ceiling mural pictured above. Interestingly, Faust chose to decorate his house in a style that was out of vogue with what was happening design-wise in Australia. At the time of his arrival and throughout his working career, Australia was immersed in all things Federation and the beginnings of an Australian style and sensibility was being developed. Even the Arts and Craft style that followed after Federation, promoted the use of Australia flora and fauna. It is not known where or when Faust received his training, but at the time of his arrival in Sydney, interior decoration in the colony was fairly well established. There were a couple of significant firms such as Lyon, Wells, Cottier and Co., who supplied and employed many of the new arrivals in industries such as building, interior decoration, and the decorative arts. As such they were a strong influence in the colony. The firm were heavily influenced by many sources including English artists: William Morris; Edward Burn- Jones; and Dante Gabriel Rossetti. These men were all members of the Pre-Raphaelite brotherhood in England. They were inspired by Italian art from the 14th and 15th centuries, and formed a design firm together producing, among other products, murals and wall coverings inspired by botanical motifs. Their influence on painting, the decorative arts and interior design was profound. Typically, their style consisted of complex compositions, great detail and intense or jewel like colours. The murals that covered Faust’s house in North Parramatta all have these qualities. These decades would have been the context within which Faust was inspired and worked. Given the lack of other work by Faust, it seems quite likely that he undertook jobs that paid the bills but his real passion and taste was what inspired the design and decoration of his own home. If it is assumed that Faust painted this mural between 1929 and 1939, it appears the preceding decades had no influence on his decorating taste. None of these movements are evidenced within Faust’s work – his mural appears to hark back to a more classical era. And, being his own home, he was free to indulge his personal aesthetic sensibilities.